Protest outside federal District Court against Kaibab National Forest, who illegally have allowed Canada-based Energy Fuels to begin digging a uranium mine 15 miles south of the rim, using a 27-year-old Environmental Impact Statement. They have ignored regulations in the National Environmental Protection Act (NEPA) and the National Historic Preservation Act (NHPA), requiring them to consult with tribes when a sacred area, a traditional cultural property, has been designated, as at Red Butte, and they are ignoring new evidence that the uranium mine will inevitably contaminate the massive aquifer that feeds the Colorado River and its many springs. Radioactive uranium has been proven to cause cancers, birth defects and DNA mutations. Once released into the environment it will go on radiating whatever it gets into for billions of years – forever, in other words. The aquifers on the Navajo Reservation, and creeks within the Grand Canyon National Park, have already been poisoned by past uranium mining. NO MORE! The Colorado River is the lifeblood of the West. The federal court in the person of Judge Campbell will hear oral arguments for an injunction to stop the uranium mine, being brought by the Havasupai Tribe, the Grand Canyon trust, the Sierra Club, and the Center for Biological Diversity. PLEASE SHARE THIS EVENT WITH YOUR FRIENDS! First hand account of experience at the Grand Canyon from Sierra Club director, Michael Brune. “Grand Canyon National Park was first protected by President Theodore Roosevelt more than 100 years ago — initially as a national monument. But most of the public wilderness lands immediately surrounding the park are managed by the U.S. Forest Service and the Bureau of Land Management. Last year, President Obama imposed a 20-year moratorium (the longest allowable by law) on developing new uranium mines in that surrounding area. That made sense because uranium mines could easily contaminate the watershed that includes the national park. Unfortunately, the U.S. Forest Service has decided to allow Energy Fuels Resources, Inc. to reopen an old uranium mine located in the Kaibab National Forest, just south of the park. That should be a serious concern for anyone who cares about the Grand Canyon, but it’s especially worrisome to the local Havasupai people. We met with tribal elders who shared both their fears about radioactive contamination and that the mine would disturb lands that are sacred to their people. 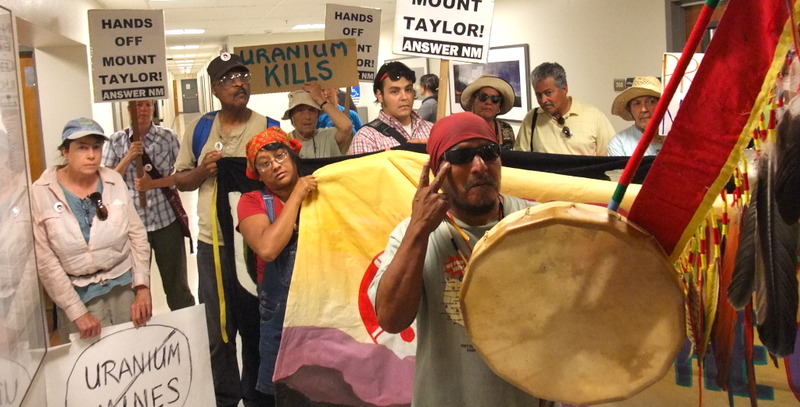 Protestors in Santa Fe say “No Uranium Mining”!